Not sure if this is a mistake price wise or not but anyway they're cheap! Did laugh at the blurb though! Also via EU Warehouse so no long wait. Convenient to Use]: 2 or more these models in different colors can work together as long as you make sure they are on the same channel. With a simple push-to-talk operation, let your children experience unprecedented happiness. 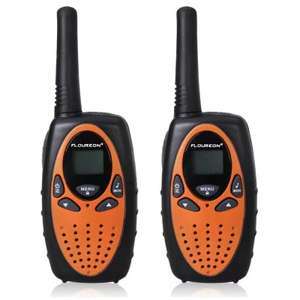 Long Distance Range]: This 2-way radio set has a generous range up to 3km open field. Ideal birthday/festival present for children.Easy to use at supermarkets, shopping centers or home. Eh? Not legal? How comes? Showing in stock for me and over 600 units available, was only an extra 7p for tracked 3 day delivery from within the EU. Will be goid for the kids to play with. Thanks op. just ordered used a few points and it came down to £3! How can you know the frequencies are illegal, it could be set to ge regular public pmr frequencies. How can you know the frequencies are illegal, it could be set to ge …How can you know the frequencies are illegal, it could be set to ge regular public pmr frequencies. Another bonus is that these use AA batteries rather than AAA so can get some good high capacity batteries in these units. These will sell out soon especially when this goes hot, over 50 units gone in 10 mins. Thanks. Managed to order at OP price with 7p delivery! I'm not sure the word jobsworth means what you think it does. No, you saw the word "discount". The description states "8 channel PMR system auto scan function". So IF, that's a big if, they adhere to PMR specification, they will be on the legal PMR frequencies and will be limited 500mW or less. done thanks.. worked a treat! Anyone know.. if I get 2 sets of these (4 in total) will I be able to use all 4 to talk together? If using your mobile you can request 'desktop site' on your mobile browser if the function exists and it will reloads with the lower OP's price. Just purchase these for my 2 children. Hours of fun hopefully! Just ordered another set hoping you are correct, will be good if these are …Just ordered another set hoping you are correct, will be good if these are higher powered than than your average 0.5W radiosAnother bonus is that these use AA batteries rather than AAA so can get some good high capacity batteries in these units. They sell these on Amazon.co.uk and while I can't be sure these are likely perfectly legal to use in the UK. Probably 8 channel 0.5w PMR446 from what I've read of the reviews and questions. So limited usefulness but they are a dirt cheap price. Anyone able to help me with this line2 or more these models in different …Anyone able to help me with this line2 or more these models in different colors can work together as long as you make sure they are on the same channelAnyone know.. if I get 2 sets of these (4 in total) will I be able to use all 4 to talk together? 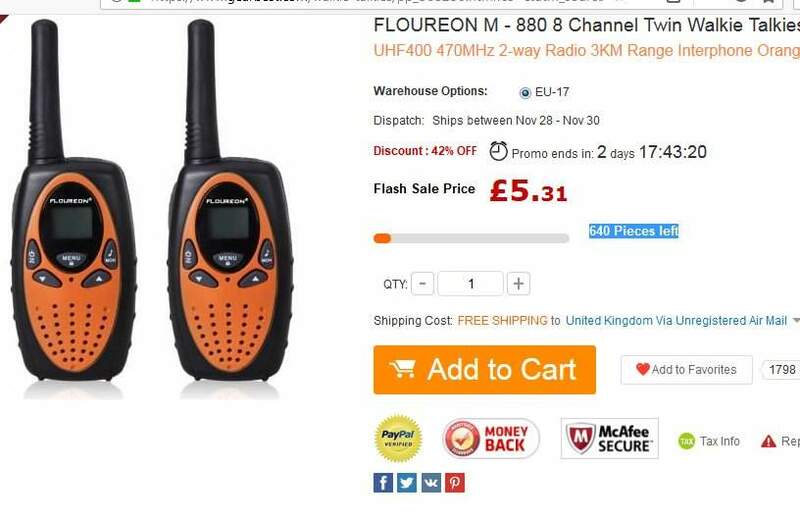 Yes if the radios are on the same channel, these radios have 8 channels so for example just make sure all your family switch onto channel 6 and they will all communicate with each other, also if these are set to the public pmr frequencies they will also work with other pmr radios from argos etc. The description states "8 channel PMR system auto scan function". So IF, …The description states "8 channel PMR system auto scan function". So IF, that's a big if, they adhere to PMR specification, they will be on the legal PMR frequencies and will be limited 500mW or less. Brilliant, as others say, change to desktop browser (can be done on mobile) for it to show as the lower price. Don't need. Ordered. Had 97p in gearbest points too. £4.41 shipped with tracking. Madness. It might do if you used batteries capable of supplying 1.21GW (gigawatts) and traveled at 88 miles/hour. I said 500mW (mW = milliwatts). Its another way of saying 1/2 watt or 0.5 watts.